10Day Ab Blast Powered By Eggology Round 2! It’s time for Round 2 or our 10Day Ab Blast Challenge Powered by Eggology! The challenge starts Thursday, June 1st, so that we can take on the first 10 days of June together. Let’s start off June with a bang! Join us! The purpose of this challenge is to encourage you to commit to 10 days in a row of total body workouts with an extra emphasis on the abs! We have incorporated Cardio, Sculpting, Exercise Ball, Pilates, Running, Sprint Intervals, Kickboxing, Yoga, Strength Training and Sports Drills to challenge your core for maximum results. By using various methods of training that use your abdominal muscles in all the planes of motion the body will be consistently challenged over the next 10 days to help you achieve incredible results. All of our workouts offer instruction for beginners to advance so everyone is welcome. Let’s get started! Screenshot of the “10 Day Ab Blast Challenge Powered by Eggology” in The Hollywood Trainer Club Virtual Gym. To help you burn the fat over your abdominal muscles you must eat healthy. Eggology is one of my favorite sources of protein because it is cholesterol free, low sugar, contains all the essential amino acids, organic or cage free and easy to prepare from shakes to delicious omelets. Below is a one week meal calendar with some of our favorite healthy meals including some Eggology recipes. 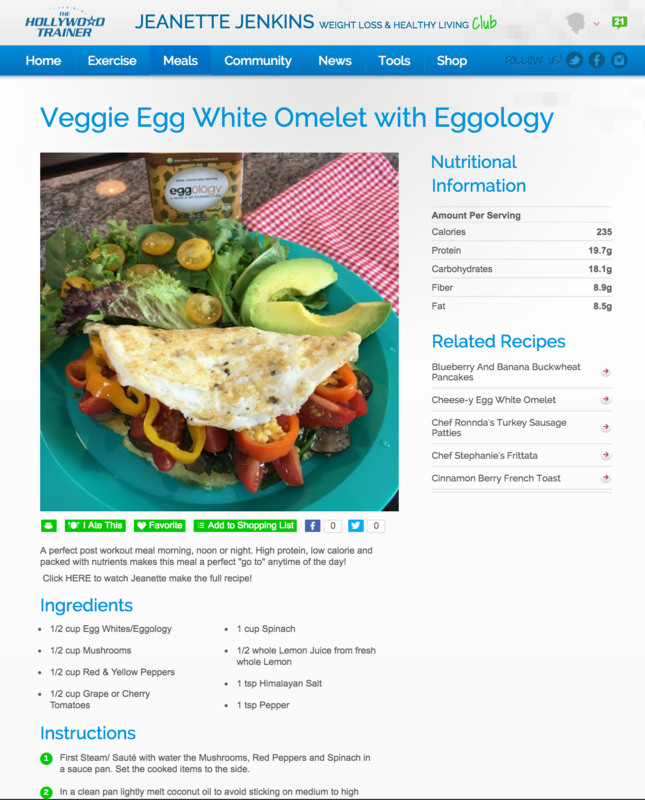 Screenshot of the Veggie Egg White Omelet with Eggology recipe in theRecipes A-Z section of The Hollywood Trainer Club. The best way to achieve your goals is to make a plan and we’ve already done all the planning for you! Post a message on the Community Wall in The Hollywood Trainer Club and let us know that you’re joining us! Click on “Exercise” and then “Virtual Gym” and then “10 Day Ab Blast Challenge Powered by Eggology” in the drop down menu and Press Play on Day1! Let’s Go!